The island of Boracay is a tiny island located 196 miles south of Manila just off the northwest tip of Panay Island, between the Visayan Sea to the east and the Sulu Sea to the southwest. The island is only 4.5 miles long with a population of just 12,000 people. Boracay Island is best known for its bright, white sandy beaches. Travel and Leisure Magazine rated it the best island in the world in 2012. There are many beaches where tourists can relax such as White Beach, Phuka Beach, Bulabog Beach, Diniwid Beach, Yapak Beach and Balinghai Beach. They offer anything from shell collecting, scuba diving, snorkeling, windsurfing, kite boarding, cliff diving, backpacking and just relaxing on the beach and watching the beautiful sunset. More than 350 beach hotels and resorts dot the island along with restaurants, nightclubs and even 18-hole golf courses. The Ati tribe is believed to be the first inhabitants of Boracay, arriving from the nearby Visayas islands. The Ati’s were aboriginals and the first inhabitants of the Philippines. Significant farming of coconut and fruit trees began in the 1900’s, but it wasn’t until the 1970’s that tourism actually started. Word soon spread about the beautiful beaches that quickly made it a favorite beach vacation spot. 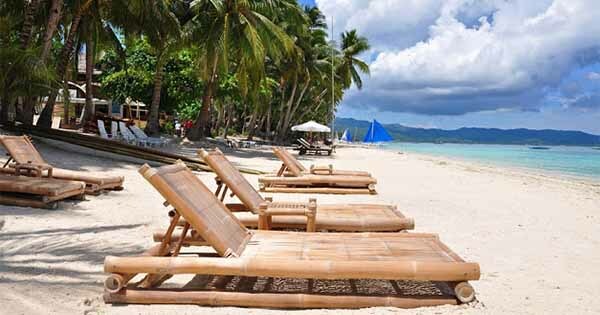 Two to four months out of the year, the weather in Boracay will be mild, with temperatures between 77 to 90 degrees and little rain. The rest of the year is hot and humid with temperatures between 82 and 100 degrees with heavy rainfall. Most tourists visit during the milder season when winds blowing from the east produce cooler temperatures. White Beach is a favorite because the water remains very smooth due to its location on the west side where it is protected from the winds. Visitors to Boracay will find English spoken on the island as well as Tagalog and the language spoken by the Ati tribe, Inati, a Visayan language. Transportation on the island is simple and includes walking and motor tricycles. Mountain bikes and motor bikes are also available. There are no airports on Boracay Island. International tourists can fly into Manila or Cebu, take a short flight to Caticlan, and then a short boat ride to Boracay. Or tourists may take a Ferry from Manila to Boracay, a trip of about 17 hours. Upon arrival, there are tons of affordable hotels and resorts to check into. Once on the island, there are plenty of activities to keep tourists entertained. Sports include golf, tennis, fishing, horseback riding, water skiing, scuba diving, cliff diving, windsurfing and more. There are bat caves, coral reefs, seashell museums, butterfly farms, and of course lots of beaches. Whether it’s a secluded beach, collecting rare seashells, water sports or watching some of the most beautiful sunsets in the world, Boracay Island, often called "the world's most beautiful tropical island," has it all. 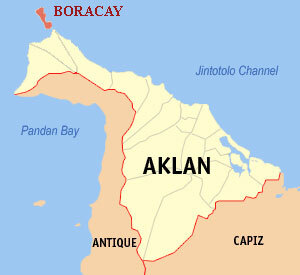 Boracay Island is located in Aklan province, which is just a short boat ride away from Panay Island. 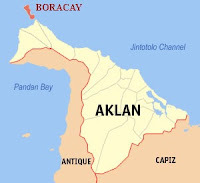 The two nearest airports to Boracay are also in the province of Aklan - one in Kalibo and one in Caticlan. A flight from Boracay to anywhere in the Philippines would take no longer than 1.5 hours.